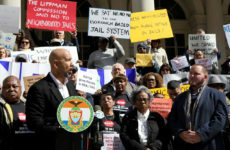 South Bronx Action Group says "We’re still here"
For 40 years the South Bronx Action group helped tenants who lived in Mott Haven, Melrose and Port Morris. Then in February, the organization lost its home. Forced by cuts to its funding from the federal Department of Housing and Urban Development to leave the offices on East 149th Street where its staff had counseled tenants on housing and citizenship issues, South Bronx Action did what many individuals do—it moved in with a relative. 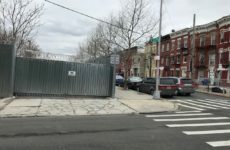 It now shares quarters with Nos Quedamos on Melrose Avenue and East 156th Street, bringing together two social service agencies of long standing. 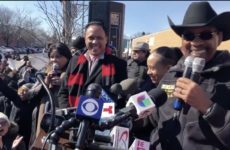 Eulogia Diaz, an immigration counselor with South Bronx Action Group said she felt “comforted” by Nos Quedamos’ offer to take her organization in. But she was worried, as well. “I didn’t know if people would make the move with us,” said the counselor. To her surprise and relief, on Feb. 1, when South Bronx Action began offering services at its new home, clients jammed the aisles where desks occupied what had been open space on the first floor of Nos Quedamos’s offices. The transition took place without as much as a hiccup. Among the many who made the move was Sory Lopez. Lopez was homebound after foot surgery. She described slowly descending 45 steps and braving the wind that gusted that morning to walk three blocks from her apartment on St. Ann’s Avenue to South Bronx Action’s new home. Lopez has been using the services of both Nos Quedamos and South Bronx Action for more than 20 years. Over the years she has joined picket lines and lobbying trips to Albany with the groups to battle for funding for community services in Mott Haven, Melrose and Port Morris. Another client, Maria Barrera, who has used the South Bronx Action’s services since 2003, learned of South Bronx Action’s move when she walked up to an empty office. She was surprised again when she made her way to the new location. She waited patiently until her name was called and she could confer one-on-one with a Spanish-speaking counselor. “When I came they were still settling down; but the amount of people here was tremendous,” Barrera said. 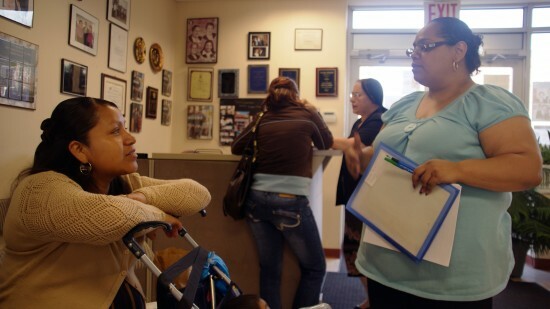 Barrera uses the group’s services to maintain her Section 8 housing subsidy. This has made her two-inch-thick file a portrait of New York City bureaucracy. For Yolanda Gonzalez, the director of Nos Quedamos, the decision to share office space has become an exercise in ensuring quality. She is committed to ensuring the 50,000 people who come in the door to visit both organizations are treated with respect and provided with the best services possible. The new living arrangement has also given the Nos Quedamos director a new role. Gonzalez has added CEO of South Bronx Action, giving her oversight over the operations that now share office space. She describes the new working situation as a boon to both organizations. Now the organization can self-refer; eliminating the need for people to trek from office to office. Both organizations want to begin to more services than they previously have been able to offer such as education classes and some domestic skill workshops. However, Gonzalez is conscious of how such a quick expansion can impact services adversely. “We want to temper expansion with the education of residents in regard to the services available for them and make sure that they make the best of the services that they have,” said the community leader.